Things are moving along in John & Alice’s family room. The “great wall” has finally been completely covered. It’s still far from finished, but at least there’s no longer any hint of orange-brown oak showing. As you can see, I didn’t get all of the excess fabric trimmed yet, but it’ll get there. Even in its unfinished state, it’s still quite an improvement over the original, isn’t it?! I’ve had a bit of a change of heart about the nail head trim. Remember how I was using these small silver nailheads (the same ones I used on my headboard)? Well, I’ve decided that I want to use a different kind of nail head trim. These just weren’t cutting it for me. Instead, I’m going to use this much larger one (13/16”) in a antique pewter finish. Not only will that mean less hammering (I’ll only have to use about 850 nailheads, as opposed to about 3,000 of the smaller silver ones), but I think the antique pewter finish will go much better with the other finishes in the room. So, it’ll be a bit of a pain to take those silver nail heads out, but I think it’ll be worth it in the end. Hopefully today I can get all of the dark gray trim attached, and then I’ll have to wait for the nails to arrive to finish up the wall. But that’s okay, because while I’m waiting, I have plenty of other projects I need to finish!! I agree with the new choice of nail head trim. Can't wait to see the final product. That really looks amazing. You have such vision! I love that you are not afraid to change if you feel you have found a better option. Ooooh love the new nail heads!! Those will look fabulous. 😀 Also, the whole wall looks SO much more sophisticated than the old version!! This is such a great idea for updating that awful paneling. I may have to steal this one!! I'm excited to see the finished room! 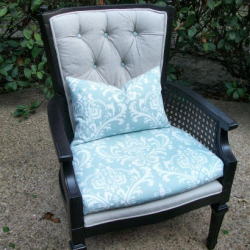 How did you make sure the nailhead trim was lined up properly? Looks great! I was actually planning the same project and I was wondering how you got the edges on the fabric to looked finished next to the moldings? It’s hard to see from the pictures! Also did you put batting beneath the fabric or just glued it to the wood panels? Thanks! !